The mixture to be separated is dissolved in a fluid called the mobile phase. This helps to carry the mixture through a stationary phase. Chromatography is a chemical technique which is used to separate mixtures. There are many different types, which will be discussed further on, but they all follow the same basic principles. The mixture that is to be separated is dissolved in a fluid called the mobile phase. This mobile phase helps to carry the mixture through a different material – this is the stationary phase. The main principle in this technique is that the different components of the mixture will travel through the stationary phase at different speeds – this causes them to separate. This is called differential adsorption. Thin-layer chromatography is conducted using a thin layer of silica gel (or alumina) – this is usually coated into either plastic or glass. The silica gel acts as the stationary phase in this type of chromatography. In this type of chromatography, a pencil line is drawn near the bottom of the silica gel plate. A small sample of the mixture to be analysed is then placed on this line. The plate is then placed in a very shallow amount of solvent in a beaker – this beaker must be covered to make sure that the atmosphere in the beaker contains the vapour of the solvent used. The solvent will travel up the silica gel plate. This means that the different components of the mixture travel at varying rates depending on their composition. In this case, the solvent acts as the mobile phase. This is illustrated well in the diagram below. As discussed, the stationary phase in this method is the silica gel. The surface of silica gel is incredibly polar because of the OH groups found at the surface – again, a good image below demonstrates this. If you repeat the TLC condition under the exact same conditions, then the Rf value will always be the same for the mixture. Anything from the temperate to the solvent used can change this value though, so you need to be careful and make sure the conditions are exactly the same. Column chromatography uses the same principles as thin-layer chromatography, but on a much larger scale. Instead of a thin layer of silica gel, the silica gel is packed into a large glass column and then saturated with a solvent of choice. 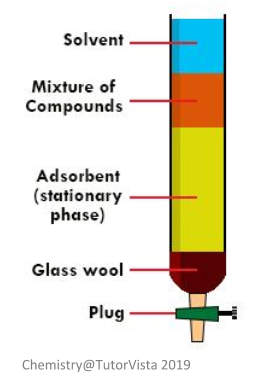 In this type of chromatography, because it is conducted in a vertical glass column, glass wool is placed at the bottom to stop the stationary phase from being washed out. In order to start the process of column chromatography, the tap at the bottom of the column needs to be opened to allow the solvent to drain – the solvent needs to be at the same level as the top of the material used to pack the column. The tap is then opened again so that your sample mixture entirely absorbs into the packing material. Next, solvent is then added to the column – this needs to be done very carefully so the packing material remains as undisturbed as possible. The tap is opened again so the solvent can move down the column and eventually be collected in a beaker. New solvent needs to be added continuously so that the column never dries out. This process is known as elution, and as such, the solvent may sometimes be called an ‘eluent’. This process allows you to actually collect the separated components of the mixture for further testing. Much like other forms of chromatography, gas-liquid chromatography (also sometimes called gas chromatography) involves both a stationary phase and a mobile phase. 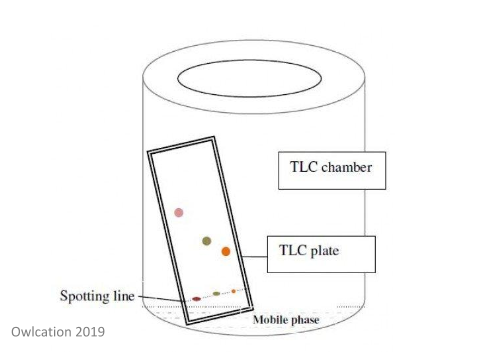 However, in this type of chromatography, the mobile phase is always a gas and the stationary phase is a liquid (which a very high boiling point) which has been absorbed onto a solid. 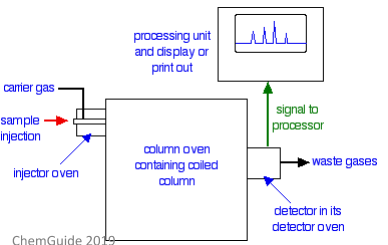 The image to the right shows a very basic schematic of gas-liquid chromatography. In this type of chromatography, a sample of the analyte is injected into the machine using a tiny syringe – the needle of this syringe passes through a septum (basically a thick disc made of rubber). This injection process all happens in an oven which is hot enough to boil the sample – this means the sample can then be carried into the column in its gaseous state. The column used in gas-liquid chromatography is typically long, thin, and packed with the chosen stationary phase. It’s usually made of steel and is coiled up tightly so that it fits inside the oven. The actual packing used in this column is something called diatomaceous earth – this is a very porous type of rock. This rock is so porous that it can be coated with a liquid (usually a waxy polymer). The actual temperature of the oven used can vary massively – this depends on the type of analyte being used. It’s usually between 50°C and 250°C. There are even some cases where a computer controls the oven and steadily increases the temperature during the process. The temperature of the column itself – higher temperatures make the retention times of every compound shorter because all of the molecules will be in the gaseous phase. Using this information, you can separate the compounds better by lowering the temperature of the entire column (you can’t change the boiling point of the compounds, or how soluble they are). In term of detectors used for gas-liquid chromatography, the most commonly used is the flame ionisation detector. The detector is placed in its own oven which has a much higher temperature than the column – this is to stop any compounds condensing when they enter the detector. 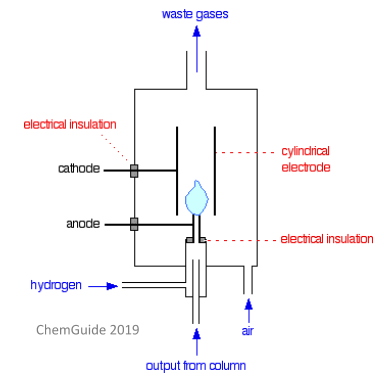 Hydrogen gas is ignited to produce ions and electrons. The positive ions are attracted to the cathode, and the electrons will be attracted to the anode (which in this case is the flame jet itself). This produces an electric current. This is a destructive method of detection, and so you won’t be able to use this method if you need to conduct further analysis on your sample. The detector will produce an output as a series of peaks – each peak represents one compound. You can use these peaks to identify the retention times of each compound and to measure the quantities of each compound. The area under each peak is directly proportional to the quantity of compound present in the mixture – a computer will usually calculate this value for you. High-performance liquid chromatography is a very sophisticated form of column chromatography, but instead of allowing the solvent to drip through, it is forced through under very high pressure. This technique also gives better separation of the compounds as the column packing material used is made of much smaller particles sizes and allows for a much higher surface area interaction. There are two main types of HPLC: normal phase and reversed phase. In normal phase HPLC, the method is essentially the same as column chromatography. The column itself is filled with silica and a non-polar solvent is used. Compounds in the sample that are polar will ‘stick’ to the silica longer than non-polar compounds will. As such, compounds that are non-polar will pass through the column slower. In reversed phase HPLC, the type of silica used in non-polar. This is achieved through the addition of hydrocarbon chains to the silica surface. A polar solvent is therefore used. Polar compounds will move quickly through the column as the interaction between the stationary phase and the polar molecules in the solution will be low. Likewise, non-polar compounds will move slowly through the column as they are likely to form van der Waals forces with the hydrocarbon chains attached to the silica. This form of HPLC is the most commonly used form.